Built originally as Blind Lane, Hartlands was little more than a dark alley around the back of Portland, creating a shortcut to Gosport that avoids the bustle and, mostly, chaos of the town centre. Amid growth and development in the town centre, housing on the western side had already been added by the 20th Century, including Hartlands Church on Portland Street. This saw the somewhat undesirable name Blind Lane changed to Hartlands Road. These houses were built out of locally-made materials and are showcase examples of local pottery. The east side only had a couple of houses to the north of the church - the rest was taken up by the gardens at Westbury Manor, or the back gardens to houses at the bottom of Portland Street. Westbury Gardens did eventually give way to the exit from the old bus station, and the corporation yard, with this later becoming a car park. Inter-war growth saw what was fields and a cricket ground turned in to three terraced streets: Western Road, King's Road and Queen's Road, filling a set triangle bounded by the graveyard of Trinity Church. 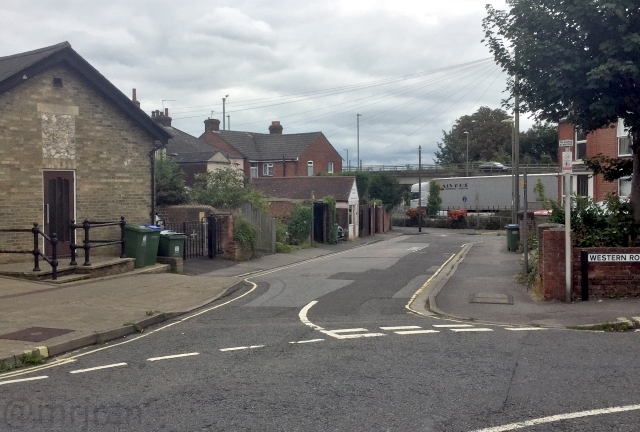 The centre of this area has always been yards and sheds (including a transport depot where the garage is), and it remains commercial today. There was also a Drill Hall (TA Centre, then a Community Centre before being demolished) and Masonic Hall on Queen's Road. At its southern end, the road merged with Portland Street to form Gosport Road. In the 1940s, these roads became northbound-only. With the opening of Eastern Way in 1971, the simple merge became a large roundabout. In 1976 Western Way saw Hartlands Road completely cut-off at its southern end, with three houses being knocked down. Instead, an additional access through to Portland Street was built, taking down four houses to the north of the church. In 1993 the southern end changed again: the link to Portland Street became a dual carriageway, while Portland Street itself became a cul-de-sac. Consequently, Hartlands Road became two-way again. As part of this development the bus station moved to Hartlands Road, benefiting from greater access but now in portacabins. This set-up lasted until 2005, with the Market Quay development making use of the unsightly car parks that now surrounded Portland Street. This saw the creation of Harper Way ("the taxi road" or "road 'round the back of the bus station"), and the permanent bus station shop set-up by the roundabout. A pub under the railway arch was known as Chequers Tavern. There would have been a local post office in Hartlands Road too.